I have missed a number of sprints because of Monday night puppy training, I have a new Great Dane Puppy. Basic puppy training is over now, so I started out going for the skinny radio. I keep it and several other radios in a steel ammo box. Well, somehow while I was getting stuff out to the garden, the Great Dane Puppy (18 weeks old and 60 pounds) got the skinny radio off the desk, and crushed the light-weight shell. It isn't allowed to run just the circuit board (undamaged), and I wasn't prepared to switch to the ATS-4B (7 ounces) or the FT-817 (2.5 pounds). So with not enough time to repair or build a new shell, I just hit the power switch on the home station, a Yaesu FTdx5000MP (44 pounds). 20m was GREAT. 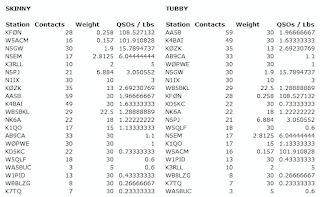 20m produced 14 contacts in IA, PA, MI, NH, TX, ME, MS and GA. 40m pretty much sucked with QSB. My noise level was low, but lots of QRM on the band. I only got TX, NM, IA and MS on 40m. With about 40 minutes left I went to 80m. I did a little better there, with NM, GA, IA and TX on 80m. I am off next month too, perhaps I'll have the skinny radio repaired, and head out to a SOTA summit now that the nights are warmer and we are in DST. 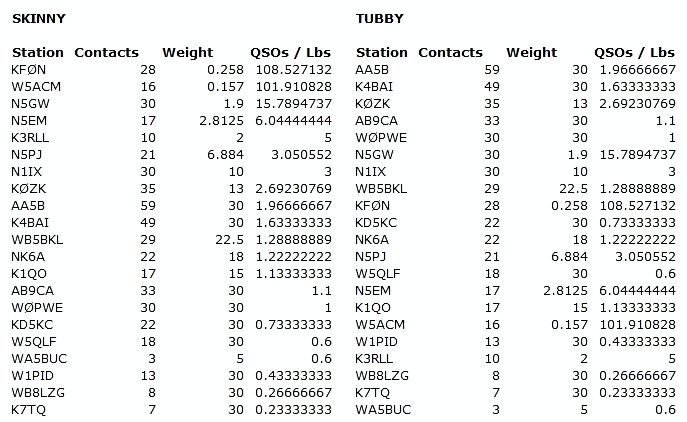 Special thanks to John-K4BAI for struggling through some real bad QSB for the contact, it was more ESP than DSP. Someone kept calling way off freq, I could never get them tuned in.... sorry bout that. Puppy photo on my QRZ profile if anyone cares ... Vy 73 - Mike - KD5KC. FT1000MP, 5W, TH6DXX, dipole, zepp, inverted V. Band conditions good on all three bands. QSOs by band: 20M: 15. 40M: 25. 80M: 9. Activity better this month than it has been for the past several years. Let's continue the upward trend in coming months. Could have used more activity on 80M toward the end. I could work from GA to NM and ME, so could have made many more QSOs if stations had come to 80M after working out 40M. 73/72, John, K4BAI. I had the K1 at 2 watts hooked up to the 800 mAh LiPO using internal ATU to CFZ , microkey, and Sony earphones. 20M was in good shape allowing 11 QSO's. The other 19 were on 40M, as the K1 four band board does not cover 80M. Signals were generally moderate to strong, with more participation than usual. It was fun. Hopefully even more ops will join in during coming months. nice to work several new-to-me calls! My thanks to all. Had fun. Nice to copy NH and ME on 20 plus on the back of my beam Hawaii. Nice surprise. Great to start 1 hour earlier and get a FB 20M band. At one point on 40M, my manual logging became quite exciting with a run after a couple CQs. This is the first contest I've been in for a while. My antenna is a 1/4 wave vertical for 40. The bands seemed to be in good condition. Highlights included K4BAI on three bands, 20/40/80, and John was my only QSO on 80 meters. Other two banders included, N5GW, AA5B, WA4ZOF, W5QLF, KFØN and WØPWE. After the contest I worked Bulgaria and the West Sahara on 40. Thanks for the contacts and fun, Arn.